What a beautiful photo. I love the warm colors. Very pretty (as usual). Great haiku. Your haiku rings so true and makes me wish memories never faded. So true!! Hope you're having a great vacation. Absolutely perfect. All of it. I really, really loved this. the photo has such special qualities ~ I was full of memories today as well! Love it. Words + photo = visual poem. Bliss!! Aww I love the autumn feel to your photo. And the crisp foreground focus. I'm sort of sad that fall has arrived and summer is past...but these lovely images makes me appreciate the change of season we're in. Love the pic! Cherish indeed. Hope you are cherishing some great ones on vaca. Such a romantic, misty pic to complement a delightful haiku! Fantastic photo - I love how you blurred the barn in the background. It captures all the beautiful colors of fall. beautiful image. great focus. and lovely, sad lines. oh it is so golden! i love this jessica! 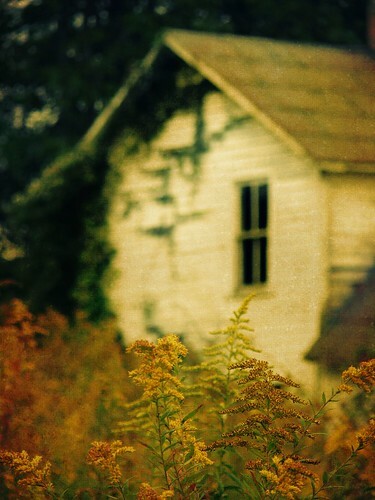 i love the yellow overlay with that subtle texture... really pretty and is that your house? Yes, It's too bad we can't stay longer in some those moments. We should all live in the moment a little more. Thanks for sharing this beautiful picture and words. Nice! and the photo just tops it off. For some reason, I can't get to the osi haiku links. That hasn't happened before. That is wonderful. I am always filled with nostalgia this time of year. So many memories make a ritual reappearance, it seems. And I realize that some have faded. I think it is important to cherish memories until they are simply a part of us. Your haiku really hit home for me in what has been an emotional weekend. For that same reason, the photo has a sentimental quality for me. Both are beautiful. That's an idyllic shot and great haiku. I don't participate in those memes but I love what you've done here. man, that's a truly great thought.